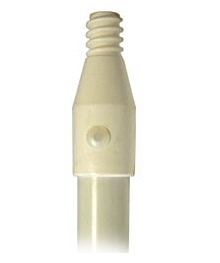 PRODUCT: 1" X 60" Fiberglass Broom Handle with 15/16" Threaded Tip (BOX OF 12). Price/Box. APPLICATIONS: For Paint rollers, brooms, mops etc. The 'space-age' synthetic threaded tip will absorb shock that breaks other tips. Two nylon rivets attaching the nylon threaded tip to the handle. Fiberglass handle part is clearly superior to other types of handles. Outlasts wood or metal threaded wood handles many times over!